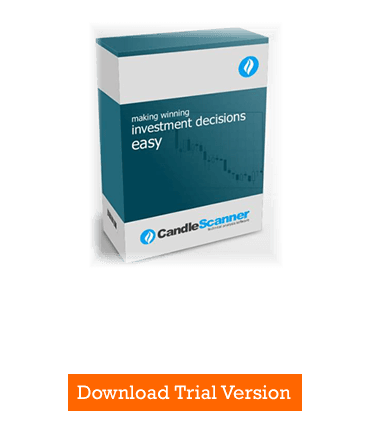 In the first part of the article, we described what a doji basic candle is and how to find it on the candlestick chart. We focused there on how the definition of a doji candle can be modified/adjusted to gain some flexibility. As a quick reminder, according to the classic definition, a doji candle is the candle where the closing price is equal to the opening price. In CandleScanner, when on the candlestick chart the CandleScanner color theme is used, such candles are marked in the red color. In the second part of this article, we focus on how changing the doji definition can influence the interpretation of candlestick patterns. Can increasing the maximum allowed size of the doji body (which, ideally, should not in any event have a body) change the pattern characteristics (i.e. from bullish to bearish or vice versa)? Figure 1 shows the Bullish Harami pattern. If we assume that the doji candle could have a tiny body (e.g. 3% of the whole candle height), then this figure could represent a Bullish Harami Cross. Both patterns appear on a downtrend and are a bullish reversal. Please note that the doji body is white. But even if the body were black, the pattern would still have the same forecast (i.e. bullish reversal), although technically it would be a Homing Pigeon pattern. Figure 2 represents a Bearish Harami pattern. Again, if we assumed that the doji candle could have a tiny body (e.g. 3% of the whole candle height), then this figure could represent a Bearish Harami Cross. Both patterns appear on an uptrend and are bearish reversal in nature. Please note that the doji body is black this time. But even if the body were white, the pattern would still have the same forecast (i.e. bearish reversal), although technically it would be a Descending Hawk pattern then. Figure 2. Bearish Harami pattern. Now let's analyse Bullish Engulfing and Bearish Engulfing patterns that belong to so called two-lines patterns. The body from the second line engulfs the body of the first line. The first line can be represented by a doji candle. In the case of Bullish Engulfing, the white body from the second candle engulfs the black body from the first candle. Figure 3 presents a Bullish Engulfing pattern. The first pattern's candle is a doji candle (please note that it is marked in a red color), having a body equal to 2.4% of the whole candle height. In other words, we are not being strict here and allow some flexibility for the interpretation of doji candles. The first candle opens at $18.12 and closes at $18.11, meaning we have a black body. 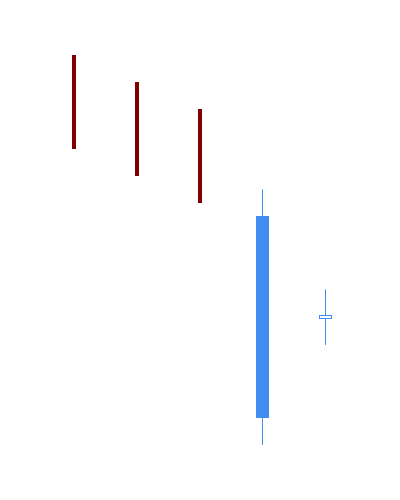 If the body were white, then CandleScanner would reject such a pattern because classic the Bullish Engulfing pattern requires a black candle in the first line (a doji candle is acceptable however). Figure 3. Bullish Engulfing pattern. Figure 4 presents another example in which a doji candle has a body (again, equal to 2.4% of the overall body height). Open price is $25.70, close price is $25.71, so we have a very small white body. 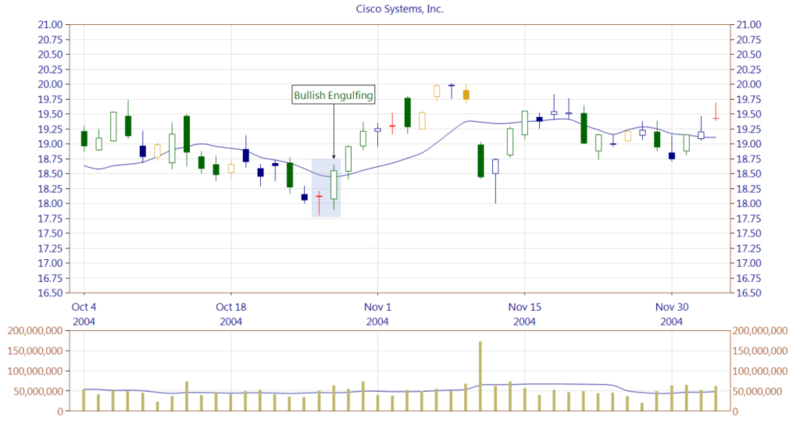 As a result, we have a valid Bearish Engulfing pattern. Please note, however, that looking on the chart, depending on the current scale, we may have a problem in recognising that the doji has a body at all, or that a body is white. Looking at Figure 4, the doji's body is not visible and, with the naked eye, we could reject the Bearish Engulfing pattern as a valid one. Figure 4. Bearish Engulfing pattern. Now a slightly more complex example with the Morning Doji Star pattern. This is a three-line pattern, meaning it is comprised of three candles. What is important here is that the second line has to be a doji candle in order to have a correct Morning Doji Star pattern. 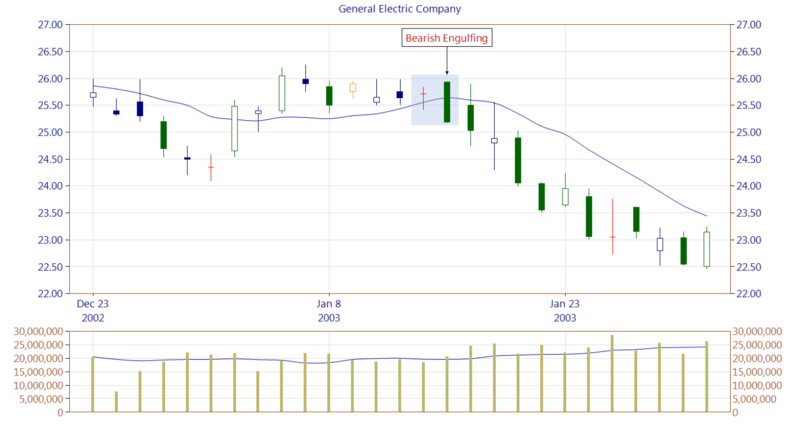 In general, this pattern is very rare and when daily candlestick charts are used it occurs on average every 50 years. If we accept that a doji candle can have a small body, not exceeding 3% of the overall body size, this pattern, however, occurs more frequently. 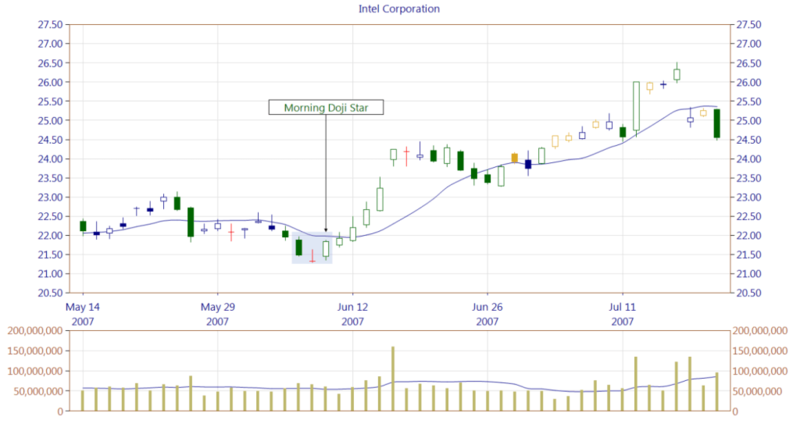 Figure 5 presents a Morning Doji Star pattern which is accepted because we allowed the doji to have a smaller body. This is an excellent example how, by not being very strict, it may allow one to improve trading results. Figure 5. 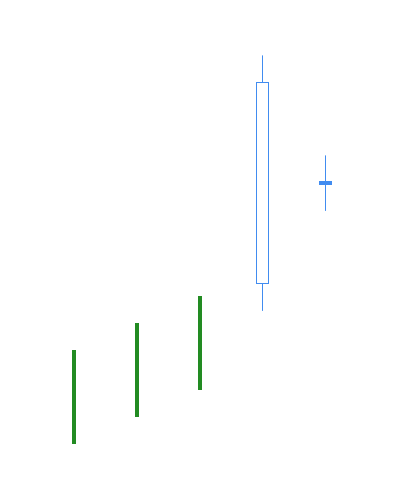 Morning Doji Star pattern. 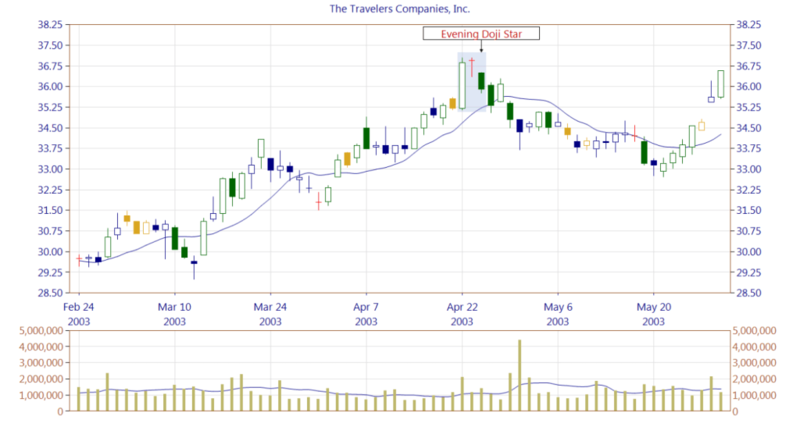 A very much similar example is presented in Figure 6 with a twin pattern -- the Evening Doji Star. Just because we are more elastic when assessing a doji candle, we can accept as a valid pattern one that normally would have been rejected. Figure 6. Evening Doji Star pattern. From the provided examples, we can conclude that it may be a good idea to allow a 'small' body in the doji candle. However, it is important to mention that this kind of flexibility is a double-edged sword. Being so flexible we may loose some other valid patterns, for example: Hammer, Hanging Man, Takuri Line or One-Candle Shooting Star. In these cases, we simply would have to reject such patterns because instead of required spinning top candle we would deal with a doji candle. With CandleScanner it is, however, very simple to experiment with different settings and see what works best.